Kayla Butler began her yoga journey with an injury; one that would limit not only physical range of motion but also force Kayla to slow everything down about her fast paced life. Working a minimum wage job while trying to stay afloat academically in the midst of confusion and anger with her outcomes, yoga was the perfect intervention in a life seemingly going nowhere fast. It began strictly as a physical practice to increase range of motion and improve flexibility but quickly developed into a love affair as yoga began to open up places in her body and spirit that were closed. As Kayla became fully enveloped in the world of yoga and comfortable in her physical body, she began to share her practice with others. She soon began to realize the perceptions and beliefs centered around yoga as it is flooded with white faces and thin bodies. A passion developed within Kayla to decolonize the ideas around who practices yoga and the body type associated with the practice. In underwear in the middle of her studio apartment, she chose to bear it all. She shared the strengthening of her spirit from frustration and falls to a newly manifested faith in her yoga practice; those who followed were able to witness the growth and invite the practice into their own lives. Kayla served not only as motivation to herself but to others who sought to channel their own inner light and love. She began to live out dreams and connect with beautiful people from all walks of life. 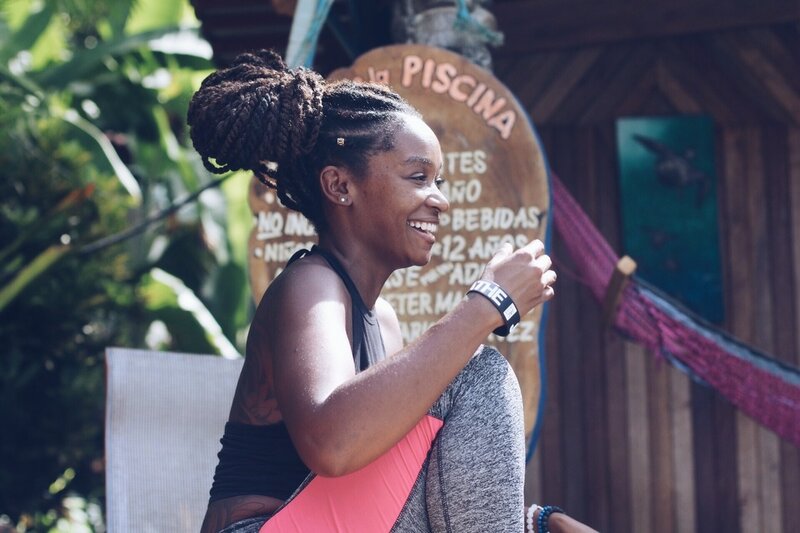 ​The yoga practice has allowed her to teach internationally at the Black Women Yoga Retreats and Women of Color Healing Retreats in Costa Rica and create a community yoga class in her hometown of Fort Lauderdale. She was even able to share her story of healing in the popular yoga publication Mantra Magazine and teaches privately to beautiful people of color. Kayla received her Masters in Aging and Neuroscience from the University of South Florida. She believes the full embrace of yoga within the African American community will change the dynamic of our thinking leading to positive lifestyle changes. She wants to change the idea that yoga isn’t accessible to people of color, she seeks to break the belief that yoga is only for the slim and flexible, Kayla would like to alter the way POC think of yoga and meditation. Through advocating and promoting healthy mental, spiritual, and physical practices she hopes to change the negative health outcomes and rising statistics for those afflicted with neurodegenerative diseases and change the stigma around mental health in the Black community.